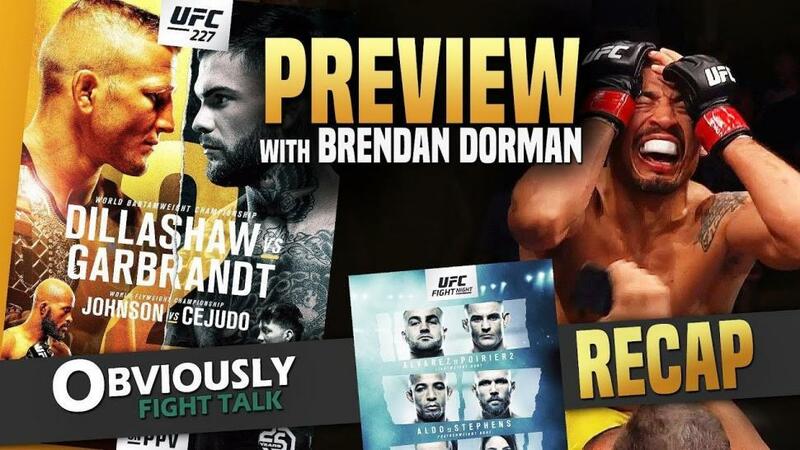 On this week’s show, MMA Analyst Brendan Dorman helps us with our UFC 227 predictions and preview. We’re also joined by MMA Referee Daniel Movahedi for a recap of the UFC Calgary results where Dan breaks down Eddie Alvarez’s illegal elbow on Dustin Poirier. SBG fighter Richard Kiely stops by to tell us why he came out of retirement to sign with Bellator MMA and calls out Paul Daley, MVP, Raymond Daniels and more. That’s not all! As always we bring you the Obviously Fight Talk Quick-Fire MMA News where we discuss Conor McGregor vs Khabib Nurmagomedov’s rumored fight, Bellator MMA’s haul of Irish and UK fightes; and in the weekend roundup we also had a brief look back at RIZIN 11 and ONE Championship: Reign of Kings from last weekend. UFC 227: Dillashaw vs. Garbrandt 2 is an upcomming MMA event by the Ultimate Fighting Championship and will be held on August 4, 2018, at the Staples Center in Los Angeles, California. It is headlined by a UFC bantamweight title rematch between TJ Dillashaw vs Cody “No Love” Garbrandt and co-headlined by another rematch between Demetrious “Mighty Mouse” Johnson and Henry Cejudo. Make sure you leave YOUR UFC 227 predictions in the comments below!